Elvin Ray Jones was a jazz drummer of the post-bop era. He showed interest in drums at a young age, watching the circus bands march by his family's home in Pontiac, Michigan. Many music critics regard Elvin Jones as the most influential drummer in the history of jazz. His revolutionary style transformed the drums as a traditional time-keeping instrument. Employing a multilayered, rhythmic approach, he created a dynamic interplay with soloists unprecedented by earlier drum stylists. Early in his career, Jones performed with such jazzmen as Charles Mingus, Bud Powell, Sonny Rollins, and Miles Davis. But it wasn't until he joined the John Coltrane Quartet in 1960 that Jones began to attract international recognition. During his six years with Coltrane's group, Jones contributed to some of the most celebrated recordings in the history of modern jazz. For over four decades, his innovative rhythmic technique has served as a catalyst for drummers who seek greater improvisational freedom. Jones was born on September 9, 1927, in Pontiac, Michigan, not far from Detroit. The youngest of ten children, he belonged to a musical family. Aside from his two brilliantly talented brothers, Hank and Thad, he had two sisters who studied piano and violin. Jones's early interest in music preceded his later affinity for jazz. Around the age of five or six, Jones visited a fairgrounds in Pontiac where the Ringling Brothers circus drummers performed. That experience--combined with local radio broadcasts of symphonic music that introduced him to the sound of the tympani drums--inspired him to become a percussionist. Whether at a parade or at a football game, Jones could be found observing a musical rhythm section with intent fascination. Much to the frustration of his mother, he began to practice rhythms on various objects around the family home. When he reached age fourteen, his older sister loaned him money to purchase his first set of drums. While in junior high school, Elvin acquired a drum method book from which he quickly learned the rudiments of percussion. "Being able to read music," Jones explained to Herb Nolan in Down Beat, "opened up a whole world of possibilities," since it provided techniques that could be applied to other musical forms. Jones's high school band instructor Fred N. Weist contributed to the young drummer's knowledge and approach to percussion. But after a year, Jones--desiring a career as a professional drummer--left school. In 1946, he ventured to Boston in search of employment. On the East Coast, he enlisted in the U.S. Army. For the next three years, he performed in various military bands. Returning to Pontiac in 1949, Jones played in groups with his brothers, Hank and Thad. In clubs around the Detroit area, Jones shared the stage with such local greats as guitarist Kenny Burrell, bassist Paul Chambers, and pianist Tommy Flannagan. As a member of Billy Mitchell's house band at the Blue Bird, Jones performed with the finest Detroit musicians as well as jazz legends like trumpeter Miles Davis and saxophonist John Coltrane. "They took me as one of their own, and I began to use my abilities," reminisced Jones in the Detroit Free Press. "It was a great camaraderie there." In 1955 Jones left for New York to audition for Benny Goodman's band. He did not get the job, but within two weeks, he joined a group led by bassist Charles Mingus. "Elvin was a 'prophet,'" declared Mingus in Mingus: A Critical Biography . "I never swung so much or rather lived so much in my life." After touring with Mingus, Jones performed for over a year with pianist Bud Powell, a musician he considers one of the "masters" of modern jazz. In 1957 Jones toured Europe with trombonist J. J. Johnson. Throughout the late 1950s he recorded with such musicians as Sonny Rollins and Stan Getz and Detroiters like Chambers and Flannagan. But one of Jones's crowning achievements came when he joined John Coltrane's Quartet in 1960. Replacing Billy Higgins on drums, Jones helped form one of the most formidable ensembles in modern jazz. Coltrane's group provided Jones with the opportunity to freely improvise within the arrangements. Along with bassist Jimmy Garrison and pianist McCoy Tyner, Jones and Coltrane conducted a powerful exchange of musical ideas. "The most impressive thing about working with Trane was a feeling of steady, collective learning," recalled Jones in Arthur Taylor's Notes and Tones: Musician to Musician Interviews. "I admired Coltrane both as a person and as a musician," he added. "It was the best of both possible worlds." In 1966 Coltrane added a second drummer, Rashied Ali. Jones, who considered this arrangement incompatible with his musical direction, chose to leave the group. Following a brief stint in Europe with Duke Ellington's band, Jones returned to the United States where he founded several trios under his own name. The first of these featured bassist Wilbur Ware and saxophonist-flutist Joe Farrel. Soon afterward, Ware was replaced by former Coltrane member Garrison. Because the trio did not have a guitar or piano to lay down harmonic foundations, making the group work proved a challenge for Jones. For as he explained in Down Beat, the drummer's role within this format "is like a root of tree.... You gotta be there, and firmly there." Among the trio's recordings was Puttin' It Together. Beginning in the 1970s, Jones organized tours to Europe, Asia, and South America and performed at clubs, clinics, high schools, and free outdoor concerts. His appearance on recordings with Ron Carter on bass and Tyner on piano influenced a new generation of musicians to take up the study of acoustic jazz, and he gained a reputation as a nurturer of new jazz talent. "Giving someone a chance is the greatest gift that you can give to another person," he commented in an interview with Ken Franckling in Down Beat. Leading his own groups, Jones employed the talents of such saxophonists as Farrel, Frank Foster, Dave Liebman, and George Coleman. By the 1990s, the line-up of his group, known as the Elvin Jones Jazz Machine, featured saxophonists Sonny Fortune and John Coltrane's son, Ravi--musicians who seem to share his philosophy. "The whole point is to play jazz, not any of its hybrid forms," Jones continued in Down Beat. "You need to have a deep, spiritual feeling for the music." Using only a standard drum kit--without the aid of any electronics--Jones changed the face of percussion in the jazz world. He is responsible for the innovation of a circular style of drumming, an approach that uses broad sweeping movements across the drums. Often beginning an arrangement by introducing a simple pattern or theme, he perpetually builds the rhythm into a near-kinetic state. By removing the traditional four-four beat on the bass drum, Jones is able to create what he calls a more "constant flow of rhythm." On the snare drum and cymbals, he plays irregular accents that often accompany soloists in furious dialogue. Although many modernist drummers try to imitate Jones's techniques, they often lack his skillful execution. For as Jones stresses, no matter how abstract the arrangement, a drummer's main responsibility is to keep time. Elvin Jones has had a profound impact on modern music. His improvisational approach helped lay the foundations for avant garde and fusion jazz movements. During the 1960s he was idolized by a number of rock musicians, including Jimi Hendrix's drummer, Mitch Mitchell. A unique and gifted individual, Jones has redefined the role of the drums in jazz music. His influence extends to a new school of jazz drummers who perform on concert stages throughout the world. As he stated in the film documentary Different Drummer, Jones believes his exceptional approach stems from the fact that he could never "comply to the standard form." Impelled by this rebellious spirit, he continues to devote his life to the pursuit of infinite rhythmic variations and creative expression. 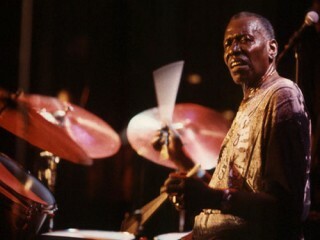 Elvin Jones died of heart failure in Englewood, New Jersey on May 18, 2004. -Puttin' It Together: The Elvin Jones Trio Blue Note, 1967. -That's the Way I Feel Now (Tribute to Thelonious Monk) A&M. -Live at the Lighthouse Black Sun. -With John Coltrane My Favorite Things Atlantic, 1960. -Live at Birdland Impulse, 1961. -A Love Supreme Impulse, 1963. -New Thing at Newport Impulse, 1965. -With others (With McCoy Tyner) Elvin Jones and McCoy Tyner Quintet Reunion Black Hawk, 1982. -(With Pharoah Sanders) Ask the Ages Axiom, 1992. -(With Tyner) Today and Tomorrow Impulse. View the full website biography of Elvin Jones.